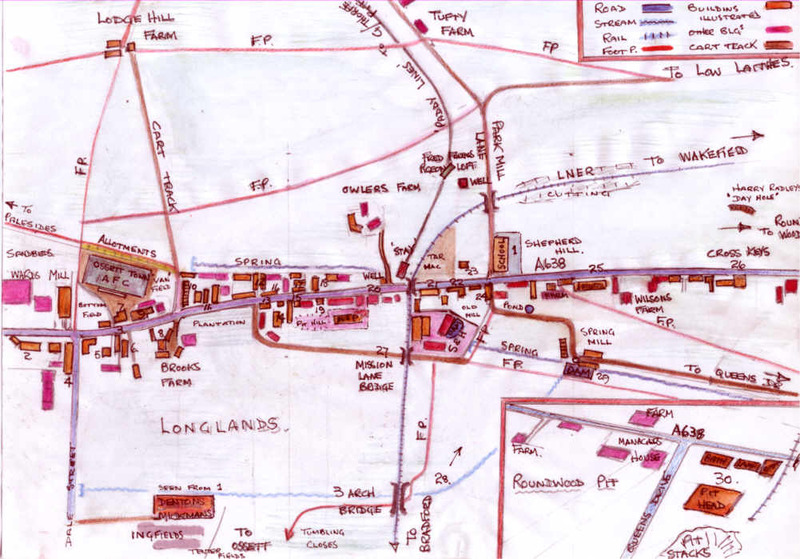 Douglas Brammer's sketch map of Flushdyke, which shows how the village was laid out before the despoiling effects of the industrial estate, which was introduced by the then Labour-controlled Ossett Borough Council in the late 1960s in the face of much opposition. In my view, the council's reasons for developing Flushdyke as an industrial estate were entirely honourable since much of Ossett's traditional industries were closing by the late 1960s. Whether Flushdyke was the optimum location for an industrial estate is a different issue entirely, although I personally think the Roundwood area, to the Queen's Drive side of the M1 would have been a more sensible location. Ossett's residents had relied on work in the mills or in the mungo and shoddy trade, which was disappearing. The coal mines at Shaw Cross and Roundwood had closed down and although there were still several large employers in the town such as Woodhead-Monroe and the Sutcliffe Moulded Rubber works, there was now a real need to attract industry to Ossett to provide employment opportunites for the townsfolk. Undoubtably, the proximity of the M1 made Flushdyke a prime location for development but this would be much to the disadvantage to those people who lived in Flushdyke who would see their self-contained village community overwhelmed with factories and traffic. Houses were demolished to be replaced with steel buildings and those hardy souls that remained were surrounded by industry.